Replacement nozzle for sprayers with brass wands. 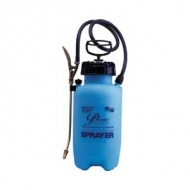 Backpack Professional 4 gallon poly sprayer with carrying straps. 4 position spray valve for control of pressure from 15-60 PSI. Right or left pump handle, adjustable nozzle and reinforced hose. 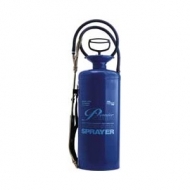 Deluxe version with fold away handle, pressure gauge, padded straps, brass and standard nozzles. Agway 2 gallon deluxe poly sprayer features anti-clog filter, reinforced hose, ergo handle, large funnel top, on board spray shield and measuring cup. 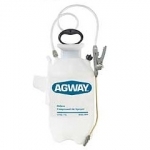 Agway 3 gallon deluxe poly sprayer features anti-clog filter, reinforced hose, ergo handle, large funnel top, on board spray shield and measuring cup. 3 gallon compressed air poly sprayer with anti-clog filter, splash guard, large funnel top, ergo pump handle, adjustable nozzle and translucent tank. Tri-poxy lined steel tank makes this sprayer very corrosion resistant. 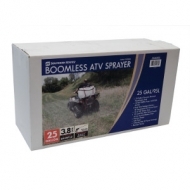 Can be used for almost all herbicides and insecticides. Tank entirely electrically welded. Clip holds extension when sprayer is not in use. Funnel top units have two stage safety lock. 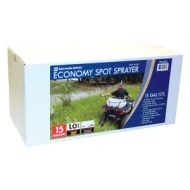 Lawn and garden 1 gallon poly sprayer with exclusive anti-clog filter and ergonomic handle. Wide mouth for no mess filling and cleaning. In tank anti-clog filter for worry free spraying, 42 in. reinforced hose for long reach. 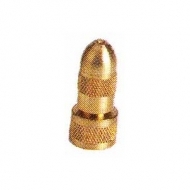 Brass adjustable cone nozzle, sprays fine mist to coarse stream. Metal shut-off with lock-on feature for continuous spraying. Built in pressure relieve/release valve for releasing pressure safely. Poly tanks are lightweight for easy carrying. Teflon coated seals and gaskets. 1 gallon poly sprayer features anti-clog filter, ergo handle, reinforced hose, large funnel top and on board measuring cup. 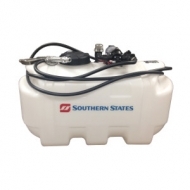 2 gallon poly sprayer features anti-clog filter, ergo handle, reinforced hose, large funnel top and on board measuring cup. 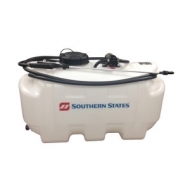 3 gallon poly sprayer features anti-clog filter, ergo handle, reinforced hose, large funnel top and on board measuring cup. Corrosion resistant polyethylene tank. Handgun delivers up to 15 ft. horizontal spray. Corrosion resistant polyethylene tank. Deluxe pistol grip handgun delivers up to 40 ft. horizontal spray. Corrosion resistant polyethylene tank. Pistol grip handgun delivers up to 35 ft. horizontal spray and 26 ft. vertical spray.